Down a Dark Hall begins like a typical absentee parent in fiction book the kid is sent far away from his or her parents. In this tale, the child is Kathryn Gordon or Kit. Her mother sends her to Blackwood Boarding School for Girls (Blackwood) while she vacations through Europe with her new husband Dan. Arriving first, she quickly meets the faculty of Blackwood: Madame Duret, her ultra hottie son Jules Duret, and Professor Farley. The next day she realizes there will only be three other students: Sandra Mason, Lynda Hannah, and Ruth Stark. Right away, strange occurrences begin to happen to each girl. Each girl begins to display new abilities they did not have before. The setting, in typical Gothic fiction fashion, is in an abandoned manor where the former occupant died in the house. Oh yeah, cue the spooky music. With the loose lips of the Blackwood cook Tracy Rosenblum is the only reason she finds this information out. Everything is hush hush and secretive. Towards the end of the novel, the girls and Jules manage to find out what happened to the girls in Madame Duret’s other boarding schools. I don’t want to spoil it for you my dear readers, but it’s not good. The current students of Blackwood certainly do not want to suffer the same fate as the other girls. 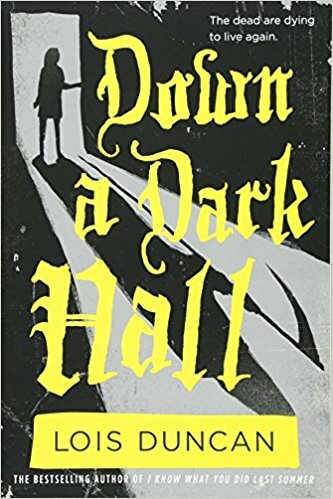 Overall, Down A Dark Hall was an easy teen thriller. I’d recommend this book for pre-teens around 5th-7th grade. While I was reading, I noticed the book ends abruptly. Duncan built up the plot and the climax, yet does not deliver what the rest of the book appears to be promising. Throughout the whole novel, Kit is like a ghost herself. She passes through the story ignoring to observe some important elements in her life, but obsessing over others. For instance, she consumes herself with trying to leave Blackwood School for Girls. Even before she has to attend, she devises ways for her mother not to leave her there. Side note: what is up with her mother? How unbelievable is it for a mother to be like ok with her child staying at a boarding school she obviously doesn’t want to stay in? Lady, it’s America, I’m sure there was a wide range of boarding school to choose from. People are trying to send their kids off somewhere all the time. Probably. You didn’t have to settle for the first one! Second, who has the money to spend 3-4 months on vacation? Am I missing something? The first word, Kit thinks of when she approaches Blackwood is “evil.” After reading the Down a Dark Hall, I’m not sure if I would use “evil” to describe what actually goes down. I would probably say Madame Duret and Professor Farley are more greedy, deceiving, and willing to exploit people to stand for a profit except by supernatural means. I would say the best way to describe them is Robber Barons of the Supernatural. Now is that “evil”? Sure, maybe to some people. However from Duncan’s portrayal of events, I’m wasn’t thinking the place was was evil, maybe creepy as hell, but not evil. Even after finding out what was really going on, I believe Madame Duret is more of a master manipulator preying on young girls for their natural psychic abilities. In my opinion, she is the real monster of the story, not the ghosts tormenting the girls and using them as vessels for artistic expression.